On the macro front, a persistent dropping in Economic Surprises (echoing last year) makes it likely the stock market rally will soon pause or end, if it hasn’t already begun that process. However, we still don’t see a general set of extreme overbought/overbullish indicators in equities. If stocks continue to go up and surprises continue to decline, then a short will become more attractive, but I would be looking to other factors in assessing how attractive. One such factor would be the potential resumption of debt worries to the fore. Spain is the only country looking likely to do this currently, with Portugal, Italy and Japan CDSs going the other way. But as can be seen from the Spain chart, previous highs are not that far off again. 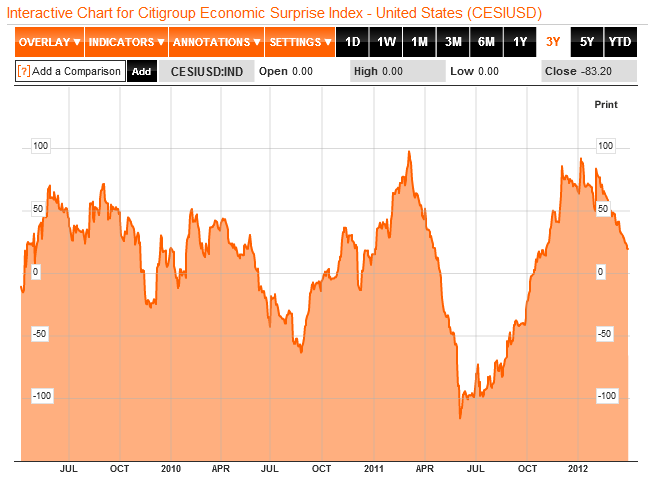 If this upward trend continues then it is likely to scrape at global bullish investor sentiment. Another factor is China. Concerns over a slowdown are playing on commodities, and new orders surveys have produced mixed results. China doesn’t want to cut interest rates whilst maintaining that property needs cooling, but is more likely to cut bank reserve requirements again in April. Until evidence becomes more persuasive of China easing and/or China growth improving, this is another potential dampener on US equities sentiment. For now then, investors, particularly in US stocks, remain unconcerned about economic surprises, Spanish debt and China slowing, but this is often how it works. The bull extends as negatives grow, only for a sudden collective shift in sentiment, with participants becoming of the view that the market has moved too far, too fast. Of course, if surprises start to improve again, Spain does something to ease CDS pressures or news from China gets better, then equities and pro-risk in general could yet advance further. One other macro factor to mention is that the latest POMO schedule has been released and net sales begin April 9th. That may be another downward pressure factor, as per McClellan’s relationship chart between the two, that I previously posted. Countering this, the Bank of Japan added to stimulus last week. A look at treasury yields and the dollar reveals a delicate position in both. 10 year yields completed their obvious move up to the s/r line shown, and now the question is whether they can penetrate and rise above that line, or whether that was just a counter trend rally. The Fed’s actions and words may have some influence in this, and the next FOMC is April 24/25. The US dollar index is likely to break one way or the other soon. As per with treasuries, dovish or hawkish words or actions from the Fed are likely to play into this, but also the general macro factors listed above, and their pro/anti risk connotations. Gold and miners remain overbearish and should therefore likely soon take off. Soft commodities rallied on Friday as inventory reports revealed steeper drops than expected for corn and others, but broadly speaking commodities are languishing versus equities, so we likely need a confluence of factors to bring about sustained strong gains. There will be no posts or model updates now until 11 April, as I am away on holidays, and taking a proper break from the markets. I will respond to mails/comments on my return. Whats your view on the break of the greenbacks triangle John? Up or down? Hi Tiho. 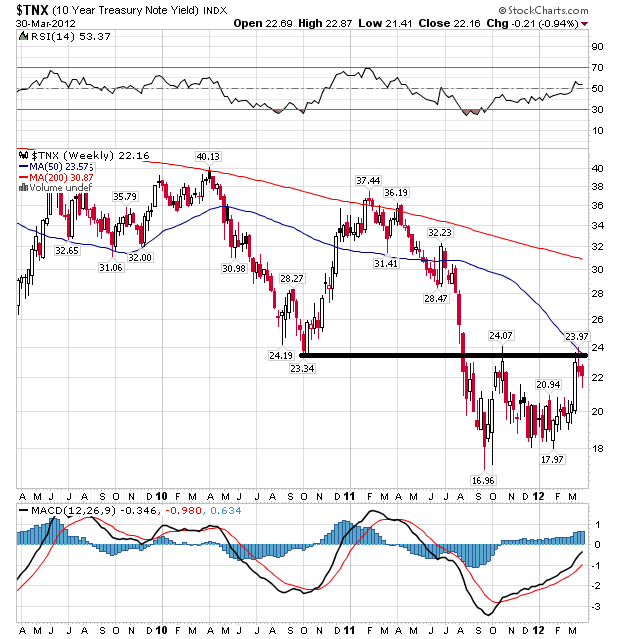 My expectation remains that the dollar will break down, commodities will burst up. But I don’t want to get wedded to a view. Sentiment is fairly neutral. Fundamentally, the Fed has made both dovish and hawkish noises in the last couple of months. 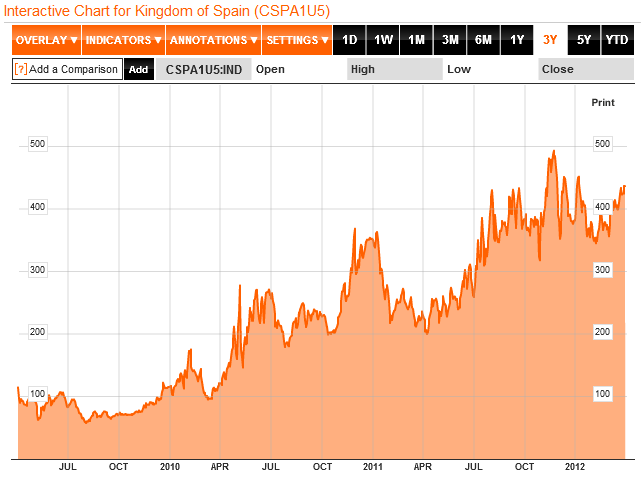 If Euro debt comes again through Spain then I’d expect the Euro to feel some pressure again. But there are still some heavyweights anticipating more US QE, which would do the opposite. So I stick with these things resolving themselves toward the dollar dropping downwards out of the triangle, until evidence deems otherwise. How about you? Pretty much the same. Jesse Livermore taught us all that when the price enters a pressure point between resistance on the upside and support on the downside, it is best to wait and let the market decide the direction. It seems to be that the USD/SGD tends to led the pack with these breakouts and inflection points. And it also looks like Sing Dollar has moved early in favour of risk on trade – chart here. it could be a leading indicator of what is to come, or it could be a false move too. Euro also seems to be hesitating and refusing to follow its partner in crime / sidekick – the Pound – higher. That is a little bit strange. Have a great holiday! And good luck with the Apple short. I think the correlation of PMs and stock market is getting weaker. It is possible to repeat April 10 correction that stock market created lower high and PMs made higher low. Even if stock market have a deep correction(8-12%), PMs may refuse to make a new recent low around 1530 under condition that sentiment had reached extemely pessimistic. Of course, we should trade like Livermore to react the market but not predict it. Also KC coffee sentiment hit extremely pessimitic but with no sign to bounce. It is safe to wait for it to take longer to form a bottom. What struck me about the Pomo schedule is its unbalanced timing. The March schedule, which seems fairly typical, has both buys and sells spread fairly evenly throughout the month. April, however, has approx 25 billion in buys through April 13 and only 17 billion after. As you mentioned, no sales till April 9th which is only a 1 billion Tips sale. But from Wed April 11 through Fri April 20 the Fed will sell approx 34 billion, 25 billion during the week starting the 16th. There is usually about a 3 day lag between either the goosing or withdrawing of liquidity by the Fed and the market reaction, up to goose and down to withdraw. Possibly the Fed is setting up a short term correction so to announce a new liquidity program at their meeting on April 25. Will miss your posts but marketwise seems like a good time for holiday. Expecting you back refreshed with aweinspiring insights. That’s an interesting take, Marlowe. And I appreciate the kind words, thanks. John a very professional looking blog with some very interesting content. Interesting to hear your take on the USD. I think its at a critical juncture now which could decide the fete of the equities market for the month of April. Feel free to check out my cycles blog. Thanks Anthony. I’ve had a look at your blog. Could you shed a bit more light on what’s in your cycles? I’ve read your summary but I’m not clear. Concur the USD is at a critical juncture, and will let it lead out of its triangle one way or the other. Well the Euro, 30 Yr Bond and Gold have spoken with strong price reversals after Fed Minutes. More QE is needed to push those asset classes higher otherwise they sell off into the next low. Tiho, a few comments from someone who has lost money shorting Apple (last time it was around $400 – Jeez!). 1. You’re probably already aware of the 1st trading day of the month but just in case: From 9/2/97 to 5/2/2010: Dow gains 3529 points, 5173 points on the first trading day of each month. Remaining 3034 trading days combined lost 1644 points. Don’t have updated numbers but the phenomenon continues although has lessened slightly. 2. Apple tends to run up at the close (last 20-30 minutes) which is best time to short. 3. I’ve had better success shorting the Nasdaq 100, usually through buying QID or shorting QLD. I shorted QLD at the close Thursday to offset my longs (mostly commodity stocks I bought earlier in the week). 4. You’re absolutely right to use tight stops. Very easy to reenter at a better price if so inclined. 5. From Quantifiable Edges (http://quantifiableedges.blogspot.com/2012/04/what-sox-is-suggesting-about-short-term.html) the Nasdaq is due for a short-term drop. What do you make of HUI sector breaking down along with the PM prices and dollar surging? 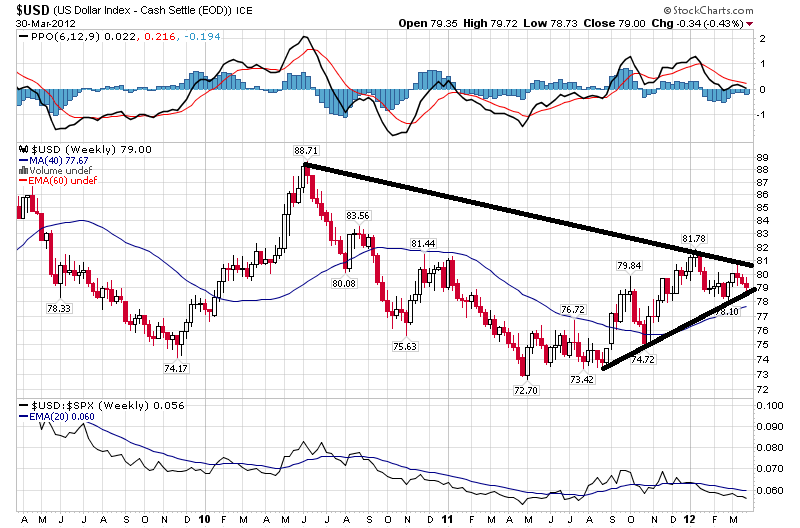 If dollar continues higher from here – commodities, including PM sector would be in big trouble. Hi 1inbluemoon, as per my post today I think that breakdown in gold and miners was a last shakeout. Regarding the dollar index, it is still in its triangle, and I still expect it to break down eventually to help fulfil the commodities finale. However, the resurgence of Euro debt issues could inspire a break the other way. I would then have to re-assess. Looks like the dollar may be in the process of forming a severe left translated cycle. John, what is your take on gold here? Anything changed in the picture? Do we disconnect from the dollar and mining sector? If so – why? oops, sorry just remembered you are away on vacation. Enjoy well deserved rest!